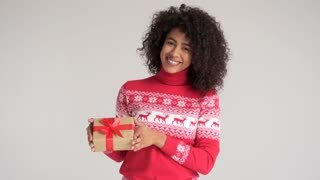 Woman with gift box on blurred Christmas background. 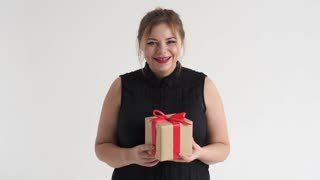 Happy smiling woman holding red gift box on defocused Christmas tree background. Merry Christmas and happy New Year. Happy woman holding many gift boxes. Beautiful smiling woman received a lot of gifts for New Year or Christmas. Winter holidays greeting.